There’s a topic I’ve been wanting to cover for a while now. Even though it really shouldn’t be, it’s kind of a hot-button topic in the running world. There seems to be a lot of debate surrounding it and today I want to set the record straight. What’s the topic? 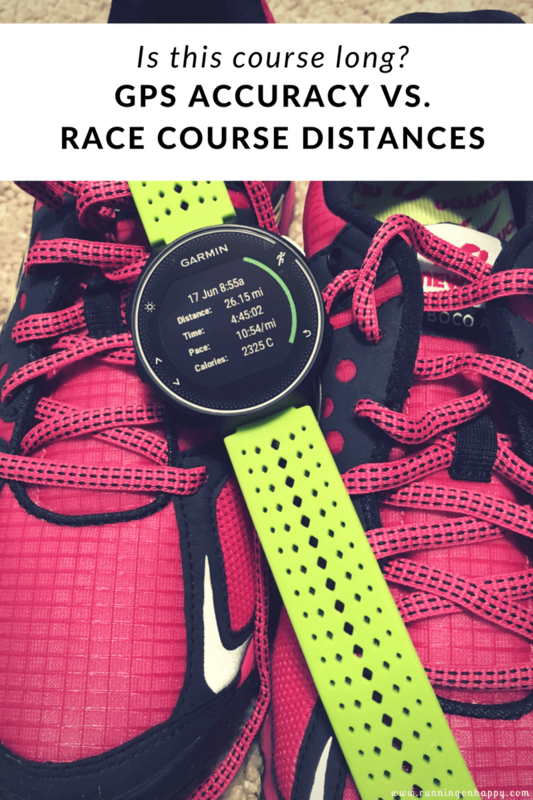 The accuracy of GPS versus race course distances. After running a hard half marathon, or a 5K that seemed just too darn easy, you may be looking at your GPS watch, scratching your head and saying to yourself: wow, that course was really _____ (long or short). While sometimes yes, courses can be long or short, I’m here to let you know that most often the course is indeed the correct length. If you’re receiving inaccurate data on your watch, either your GPS watch isn’t as accurate as you think, or you’re not running the shortest possible route (possibly both). Your location relative to the satellites in the sky matters, as does the amount of people trying to snag a signal from them. Think of it like this: when you’re lining up for a race and you press the “satellite” button on your watch, do you get a signal right away? I’m guessing depending on the firmware of your watch model, your answer may be no. Let’s also consider the “auto-pause” feature on many GPS watches. How many times have you stopped to cross a road only to have your watch pause and then once you start running again, it takes several seconds for it to restart? This happens to me on almost every run. While GPS technology is highly accurate, it’s not the end-all, be-all — especially when it comes to race distances. There’s still room for error, even if it is small, like 10 meters. I’m borrowing this example from my coach using my own data. If you run 400m on the track, you know exactly how far 400m is. It’s simple. It’s one time around the track. Start at the numbered line, end at the same numbered line. Take the same 400m distance around the track but view it in your GPS log and you get an entirely different picture. In this picture, you see my track workout as depicted by my GPS watch. I was in the same lane (lane 1) through the entire workout. So why does my route look like I was on the football field and not on the track itself? Great question. Let’s examine. Curves matter — a lot. Lane 1 of a 400m track is 400 meters. Lane 8 is, by all intents and purposes, just about 46 meters longer if starting and ending from the same position as lane 1. (This distance discrepancy is why there’s a staggered start for track meets.) But the straights are straight — they are 100 meters long regardless of which lane you’re in. It’s the curves that add distance. Following that logic, let’s move on to road races. If you’re running any type of course except for a straight out-and-back, or a straight point-to-point, you’re likely to have twists, turns, and curves. Some races minimize hairpin turns, while others are notorious for them. Given the 10 meter +/- in GPS accuracy as discussed above, along with a potentially curvy route, it’s easy to see that GPS technology in these situations may not be as accurate as we previously thought. To be a Boston-qualifying course, the race course must be USATF or AIMS certified. In the U.S., a course must be certified in order for a runner to be eligible for a record or to be nationally ranked. A posted statement by the USATF on GPS use by runners acknowledges the variance of quality among GPS devices, and also mentions their effectiveness against such “obstacles” such as tall buildings, heavy tree covering, and other reception issues. Have you heard of running the tangents? In geometry, a tangent is a straight line that touches a curve but doesn’t intersect it. If a runner is on a somewhat curvy course with lots of turns onto different streets, or perhaps just a windy road, the likelihood of a runner running the tangents perfectly, or the SPR, is very small. In a large race, it’s next to impossible to ensure you run the tangents 100% of the time. Not efficiently running the tangents will yield longer-than-advertised race distances. So while the race may in fact be a USATF certified race course and your GPS is spot-on and your firmware up to date, if you don’t run the Shortest Possible Route, you’ll likely run farther than the distance you expect to run. GPS, while highly accurate, is not 100% accurate. Unless you run the SPR (shortest possible route) of a certified race, your distances will likely be long. There are certainly races that are longer or shorter than the distance you expect to run. But be aware that this is most often not the issue. Also be aware that GPS does have its faults. If you find yourself running “long” in races, it might be worth some time studying the race course and learning to run the tangents. Better yet, if you can, run the race route ahead of time! 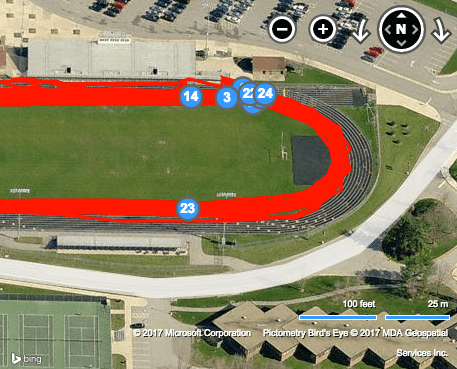 This will help soothe any pre-race anxiety as well as allow you to really know where the shortest possible route is come race day. Unless a race recognizes their course is long or short, please do your best to keep your frustrations inside when comparing your GPS data to the advertised race distance. Race directors put a lot of hard work into ensuring their courses are up to standard, the race goes smoothly, and runners have a good time. Let’s cut them some slack. I hope this post helps clear up any questions surrounding GPS use, GPS accuracy, long/short race courses, certified courses, and running the tangents. Questions? Post ’em below! 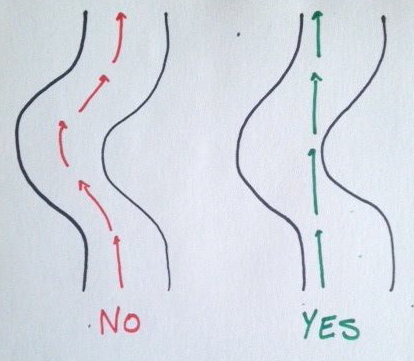 When racing, do you consciously try to run the tangents? Does your GPS watch have the auto-pause feature? Do you remember to turn it off during a race? <—- I don’t! I always forget. Oops. Linking up with Nicole, Annmarie, and Jen for Wild Workout Wednesdays. I’m horrible for running the tangents. I’m always long for races. I try not to weave as much as possible. I find it keeps me at a more even pace, and especially holds me back in the beginning! I rarely go out too fast anyway, but not weaving helps. And I totally agree — it’s a run. For fun. Why get so angry over a GPS discrepancy? I try but it’s hard to run the tangents especially if it’s a big race. I usually run long vs short for races! I ran a half marathon a couple of years ago and I could tell by my watch that the mile markers were way off. Turns out, the course was .3 miles short! People get so angry at races when they finish and it says more than the perfect distance. Um, account for tangents, but also for all the weaving you did at the beginning! I also just generally don’t trust GPS, and I always run longer on my training runs just in case! I rarely weave anymore. It’s not worth the fight and it also helps hold me back at the beginning of races. And yes, they get so angry! It’s incredible, really. I am really, really loving this post–you’re bringing up so many great points, Rachel! GPS definitely isn’t an end-all, be-all thing. (Especially if you’re running in a city.) I try to run the tangents the best I can, but if I’m feeling tired and I have to expend more energy or fight a pack of people to run them, I’ll skip it. Right, exactly. Buildings, trees, etc., all have an impact on GPS accuracy. It’s best to use it as a training tool but trust the distance when you’re racing. I had no idea about this! Great post. I am not a data freak so I wear my watch sometimes but I only look at it to see the map or maybe if I felt a certain section was hard. Honestly, I feel like it shouldn’t matter. I suffered during that half marathon and worked hard whether my GPS reads 12.9 or 13.4. I recently ran a 40 miler and my GPS at the end said 41. A whole extra mile! However, I still consider it a 40 miler and when you get into higher distances, it’s not really about PRs or exact measures, but how you handle the course. Ultras are tricky like that… they’re much less precise than road races. Mostly because if you’re running 100 miles, what’s another .2, right? This is a great post – Thanks Rachel! I usually do run a little long on race courses. For the NYC Marathon there is a line you can follow that really helps with the tangents. I really tried follow that and was pretty close to 26.2 when I finished the race. people always seem to be up in arms when their watch does not show the exact distance of the race but everyone ran the same course! I have heard about running the tangents but in a crowded race it’s hard to do. I have also noticed, like you said, when you stop at a light and the watch auto pauses, it takes it a few seconds to get back to where you are. It’s a good training tool but not perfect. I feel really bad for the RDs who catch the slack from people that rely on their GPS watches more than the course distance. They put in a lot of effort to make sure runners have a great, reliable race. You did a great job breaking it down for those doubters. I think it’s funny how people want to argue everything these days! It’s GPS, people. Sometimes my GPS goes crazy and gives me a totally wrong distance. It hasn’t happened with my new Garmin, but my old one was pretty unreliable. I know, why do they always argue so much? Super frustrating. Definitely try to run the tangents!! My last race was an out and back with NO curves – UGH! I mean, that’s a good course for accuracy. But that must have been pretty boring, huh? Good, informative post, but one statement you made is, I think, incorrect: “Your location relative to the satellites in the sky matters, as does the amount of people trying to snag a signal from them.” My understanding of the way GPS devices work is that they are not affected by the number of devices being used at once. GPS satellites broadcast a signal that devices listen for–there isn’t two-way communication. Some people tend to think that it’s similar to cell phone communication, where specific areas can be saturated by too many users at once. I think it’s more like broadcast radio. It doesn’t matter how many radios are tuned into your favorite FM station, just like it doesn’t matter how many watches are tuned into a GPS satellite. That may be true. Anecdotally, I’ve personally had issues (more than once) trying to get a signal before a race. No cloud cover, no tall buildings, and no tree canopy. If it’s not everyone trying to find a signal at once, what are some other possibilities? I’ve just added a post to the link up, hops it’s Ok! I enjoyed this post about GPS and distances. Of course it’s okay! Thanks for linking up! This is so interesting. I kinda thought that running the shortest possible distance would be cheating somehow…. had no idea this is how it is measured! So much yes for this! The course is correct, your GPS, maybe not. I’ve only gotten frustrated once and that was when my watch measured a race over a mile long, now that’s just frustrating. I don’t know what’s going on with the linkup. I changed the parameters around so you should be okay to link up now. I’ve had friends run longer than a mile over during races due to a lot of weaving and not running the tangents efficiently. It’s definitely frustrating. Can I marry this post? So many people don’t understand how GPS works and try to blame a course for being “too long”. You’ve explained things perfectly! 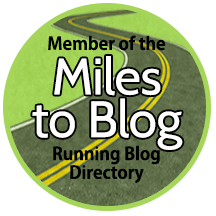 I try to hit the tangents as best as I can but even still, I know I’m not going to get a perfect mileage unless I’m running a race like Broad Street or the Parkway Classic 10 miler where you’re mostly running in a straight line the whole way! The blame game is certainly real, that’s for sure. As much as I try to run the tangents, it doesn’t always work out so well. I’m okay with that! Great information! I’ve been told to keep the Garmin going for a good block or so PAST a race finish if you want to log a full race, just in case the GPS shorts you. In a past marathon I think it actually ADDED more than a mile! Really? I’ve never heard that advice before. I wonder why running past the finish would yield better results? What I mean is, some people get upset if their personal GPS device (whether it be a phone or a watch or whatever) shorts them on the distance (like happened to me a few times in Chicago with interference from the skyscrapers), and then when they upload it to Strava or whatever site they may use, it doesn’t “credit” them with completing a full marathon (which may be a challenge or goal they signed up for). So I’ve heard just keep the GPS device on even once you pass the finish line–even walking for a block or two–just to make sure you log the full distance. The funny thing is that sometimes GPS has courses as short, even if they are certified. I have had this happen a few times- always on courses with a lot of trees. I’ve also heard my watch lose signal on one of those courses – probably due to the trees. When a course is *legitimately* short and *not* certified, people do not complain… but then when a certified course is long (meaning: 3.13 or something very likely), people beat the race director up. Also, the time that displays on the clock and the results is your actual 5K time. Your race ends when you finish, not when your GPS hits 3.11 ;). I know, right? Isn’t that so funny how that happens? I feel terrible for the RDs! I am going to have to go back & read this again when I have a bit more time! Mostly I find my Garmin to be extremely accurate. And usually when a course comes up long or short, it’s not just me that’s finding that. I never put on the autopause because of my walk breaks. I do try to run the tangents but it can definitely be challenging sometimes! Good idea about not using autopause! I could see how that could give you some wonky readings for sure. My Garmin is fairly accurate as well. But even if it’s off by a little bit, the race is the official distance on record anyway — not my watch! Fantastic post, Rachel -you explained this issue so well! I have to hold my tongue when people adjust their race times based on their watch. I try to pick races that make it easy to run the tangents – my last marathon clocked in on my watch at 26.29, so I don’t think I did too bad on running the tangents. I never run with autopause, even on daily runs – the autopause function would start and stop on hikes due to tree cover, so I just turned it off, forgot about it, and then actually came to like running without it since I run through wooded areas. I manually pause at traffic stops instead. I use auto-pause because I’ve paused manually and forgotten to restart my watch too many times to count. 🙂 Now I just let it go and hope for the best. But I know distances of my routes fairly well so if something gets screwy I don’t get too hung up about it. My complaint is when people gripe and moan about race distances when they compare to the GPS watch. Drives me crazy. My auto-pause is permanently off because it likes to pause while going up steep trails. Rude. My Garmin usually measures very close to the claimed course distance. The races where I’ve had noticeable discrepancies were small 5Ks where the course was “measured” by someone else going out and running it with their GPS watch. I’ve definitely run some races where it seems like the course was long. But usually my watch is just a little off and thats definitely expected. As much as I try to run the tangent sometimes it can be really hard! Running the tangent is definitely difficult, especially when it’s a large race! There have been a few times when I thought the course was off – one time it actually was (and it was certified). It was supposed to be a half marathon but was only 12.8 miles. Really bummed to learn I didn’t actually PR, lol. Oh wow! That must have been a major screw up if it was a certified course. I am very mindful of running tangents and I’ve only had distance discrepancies when tall buildings/tunnels threw my Garmin off. I speak from experience when I say the vast majority of runners in races are not even close to running tangents. In a half or full marathon, that adds up to lots more work! This is a great reason to look at a course map and get an idea of where the turns are. Just looking ahead as far as possible helps too. I tend to have signal problems when I’m at a race in a new area I’ve not been lately. My Garmin tends to get familiar with my usual surroundings. And no, most runners don’t run tangents! I love all the information on this post. Very detailed! When I wanted to break 1:40 on my last year’s half marathon, I studied the course and even ran it to figure out locations of the curves (there were plenty) so I can attempt to run tangents. It wasn’t even easy especially when the race was crowded. I always end up running long, but when I’m weaving around people, it’s hard to figure out the tangents. Oh! I didn’t even attribute the “running the tangents” from geometry, but now that makes more sense. Great post and I did know GPS is not 100% accurate. It is a great tool, but not 100%. Yep yep, some people take the GPS readings very literally! I always struggle to run the tangents, particularly since I do run-walk intervals so I usually try to stay to the right side of the course, especially when its really crowded. Once the crowd thins out a bit I’m able to focus more on running the tangents, even while maintaining my intervals. I can imagine that would be fairly difficult! First off, that’s a lovely track! Secondly, why in the world does the GPS go bezerk sometimes and WAY off track?? (Like my long run last week) That’s the only time it’s super annoying. I can’t believe people go that crazy over this though – ha!! It IS a lovely track! 🙂 You should come run on it with me sometime. It goes berserk by you because of all your tall buildings. Bounces around, unable to get a good reading, etc. great post! I need to watch my tangents! I have a tendency to run a race long- thanks for the tips- it all adds up for sure! I hate running a half mile further than everyone else! Thanks! It’s hard to run the tangents perfectly. But even just being aware of it is better than nothing. That is a great post. When I ran my first race (10k), my app (I didn’t have a GPS watch at the time) definitely told me that I ran more than 10k… and I was like “WTH”? Haha… and then of course I investigated (because I am a numbers girl!) and I read about the app inaccuracies and ‘running the perfect race line’ and all that. I do understand that even the GPS watch is not 100% accurate and it also depends on how often it pings the GPS signal and how it calculates the distance to the last pinged point…. so there are definitely a lot of factors going into the getting accurate measurements. Haha, maybe you just need to add a little more speed work! The phone apps are much less reliable than GPS, too. YESSSSS Great post!! I hear so many people get confused about this!! It can be frustrating, no doubt!